Last Christmas in Paris has gone straight into my top reads of this year. It’s a book which I was desperate to read from when I first saw the publicity start to appear – I mean, how beautiful and atmospheric is that cover? I must thank Kelly at LoveBooksGroup blog for giving me a loan of her copy – I might give you it back Kelly! 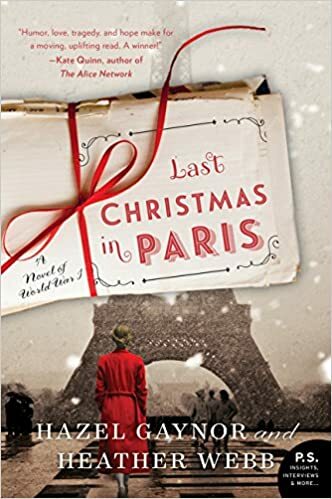 There was always a fair chance I was going to like this book as it ticked so many boxes for me: the story unfolded through letters, it takes place mostly during the First World War, at its heart is romance, the romantic city of Paris features and also Christmas. But I didn’t realise quite how much the story and characters would capture my heart. It tells the story of Evie and her brother Will and Will’s best friend Tom as they face the horrors of World War One. It’s not giving anything away to tell you that the story begins with a very elderly and failing Tom travelling for one ‘Last Christmas in Paris’. The three had always planned to spend Christmas in Paris when the war was over but now there is only Tom left. Taking with him the letters from the girl he fell in love with during the war, he plans to open the very last letter she ever wrote to him while in Paris. This is a book which touched me emotionally and left me a teary mess on the bus as I read the final chapters. I shed tears for characters who had become vividly real to me as I read the book. The book appealed to me on many levels. I am always fascinated not just by how the men who went off to fight coped with the horrors they encountered daily but, also by how those left at home coped with daily life. Evie was an excellent character who brought this to life through her letters. Aware of her privileged lifestyle, she became determined to do her bit to help the war effort. The anxiety and despair of waiting while not hearing from loved ones was clear. It must have been so awful hearing about the fighting in the newspapers, waiting and waiting for a letter from the front while dreading the arrival of a telegram with all that might signify. I was really surprised by just how much was being sent to and from France by post during the war, not just letters but also small yet useful gifts such as socks and gloves. It is incredible to think that during a time of such awful fighting, there were still dedicated people making sure that as many as possible letters and parcels did get through. I was very intrigued that two authors had co-written this book and have to say they have done so remarkably well. I would love to know how this collaborative writing process worked, whether they wrote separate characters or worked together on it all. The voices of the various characters were certainly very distinctive and it was easy to get a feel of their different characteristics. Evie was, perhaps unsurprisingly, the character I felt most drawn to. I loved her determination and courage as well as her eloquent writing. With apologies to all the other authors whose Christmas books I’ve read so far, I highly recommend that if you only read one Christmas book this year you make it this one. Although, having said that the book isn’t just a Christmas story. Spanning the whole of World War One and beyond it is just the most beautiful, romantic and touching story and could easily be read at any time of the year. So if you don’t have time to read it right now, get a hold of copy anyway and read it when you have time to curl up and savour it. Last Christmas in Paris is published in all formats by William Morrow Books. It should be available in all good bookshops or you can order a copy online here: Last Christmas in Paris. I KNEW you would love it! It will be on my top reads of the year too. Great review! I will add this to my December TBR list! I just ordered this book, it comes on Saturday, I cant wait to read it. I heard so many good reviews. Check out the book, Last Christmas in Paris, by Hazel Gaynor, as featured on the Portobello Book Blog. just picked it up from the library today for my Christmas Reading Challenge – thanks for the recommendation! This is singing to me!